How Do I Choose the Best Eyelid Primer? Eyeshadow primer can be applied with a makeup brush. Primer covers the eyelids in order to ensure makeup goes on smoothly and stays. When selecting an eyelid primer, also known as an eyeshadow or eyelid base, consider the condition of your eyelids, the type of eye makeup that you use, as well as your budget. Different cosmetic brands have different philosophies of how an eye primer should work, so it is important to carefully read product packaging and talk to cosmetics sales reps about your concerns before making a purchase, particularly if you purchase an expensive product. If possible, get several samples of eyelid primer so you can try them out at home and see how they work for you. Eyelid primer is used by many people as a way of smoothing out any discoloration on their eyelids, to provide a smooth surface for applying eyeshadow, and to prevent eyeshadow from creasing. Some eye primers are a neutral color, while others are sold with a yellow tint that is supposed to address the problem of redness. Not all cosmetic companies make an eye primer, and there are some cosmetic experts who believe that regular foundation or concealer works just as well as any eyelid primer. Before you purchase a primer for your eyes, try using the foundation or concealer that you already have on your eyelids. You may find that a separate product is unnecessary and that you can save money by simply using the makeup that you already own. Another thing to think about is the type of eyeshadow that you regularly use, as some eyeshadows may work better with a primer than others. If you have a favorite department store cosmetic brand, you may wish to speak to a salesperson about your concerns. In many cases, you can ask for samples that you can bring home and try with your regular makeup. One good way to test eyelid primer is by gathering different primers and trying a different one each day with your regular eye makeup. At the end of each day, check out your eyelids and see how well your eye makeup is holding up so that you can choose the product that works best with your skin and cosmetics. In all cases, you should pay attention to the condition of your eyes and how they react to specific primers. This is because your eyes and the skin around them can be very sensitive to ingredients in cosmetics and skincare products. If you find that your eyes are irritated after using a particular eyelid primer, discontinue use and find out if you can return it for a refund. How Do I Choose the Best Eyeshadow Primer? How Do I Choose the Best Foundation Primer? What Is Press on Eyeshadow? Has anyone used an eyelid primer or base with moisturizing and anti-wrinkle qualities before? I just saw an eye makeup primer which has these qualities and it sounds really interesting. I'm an air hostess and I fly international. I wear eyelid primer everyday. I need my eye makeup to stay fresh and clean during the entire flight. The problem is that both my skin and my eye area dries out a lot on flights because of the ventilation. I've been noticing more and more wrinkles around my eyes lately. I think it would be great to use an eyelid primer that can both maintain my eye makeup and protect against wrinkles. But does it actually work? I would love to hear from anyone who's tried an eyelid primer like this. @ddljohn-- Those are good points. I just want to add that each eyeshadow primer is meant to be used a little differently. I had one eyeshadow primer which caused the same problem of settling into creases. When I talked to a brand salesperson about it, she told me that I was probably using too much product. I tried using less of it next time, and it worked perfectly. So no matter which primer you're working with, it's important to learn the directions to use it. What I look for an eyelid primer, aside from the product quality is the packaging. I hate eyelid primers in jars and bottles. They are so unhygienic! 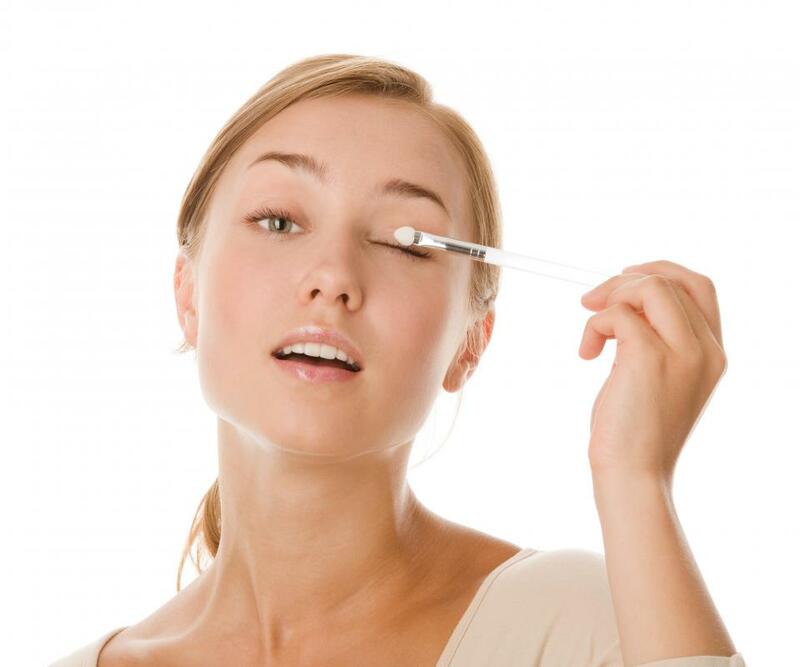 I apply my eyelid primer with my fingers, so I need a squeeze tube to keep the product free of germs. I completely agree with the article that samples are a must before investing in a full size eyelid primer. Most of the eyelid primers I've seen cost quite a bit and they don't always work well, so it's not worth spending the money. I got a small sample tube of a well-known liquid eyelid primer recently. Even though this product is highly rated among eyelid primer reviews, it just didn't work for me. The primer settled into the creases on my eyelids and so did the eye shadow. I didn't. This can be a problem when you don't want a whitish appearance in your eye makeup. I'm glad I didn't buy this product! I'm going to look for an eyelid primer that blends well into my skin and has the same tone as my skin color.